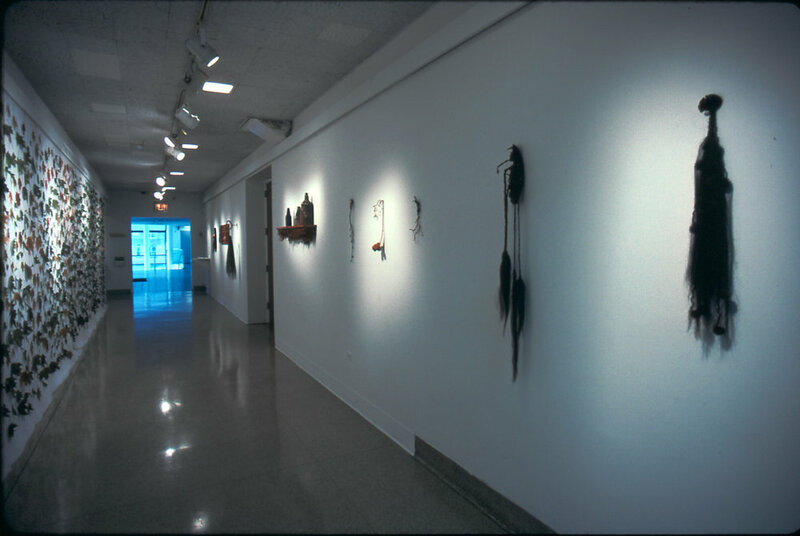 Commissioned and exhibited by the Bronx Museum, was a three part evolving installation with an educational component. The piece followed the transition of the seasons for five months from late summer to winter and combined natural materials, oral history, folklore, and science to capture the essence of seasonal change. Click to view artist statement, project narrative and images Part I, II, and III, press quote, viewer responses, and tree lore. On the Full Harvest Moon, the artist collected more than 2,000 leaves from the five kinds of trees in Joyce Kilmer Park, near the museum. She pressed, dried and pinned each individual green leaf to a 50 foot long scrim of gossamer white fabric mounted two inches from the wall in the Bronx Museum Education Gallery. Behind the scrim photographic images of human eyes in varied sizes were mounted at different heights gazing directly at the viewer through leaves and scrim. Concurrently, Pou compiled information on the history of Joyce Kilmer Park as well as the origin, history and folklore of each type of tree found in the park. 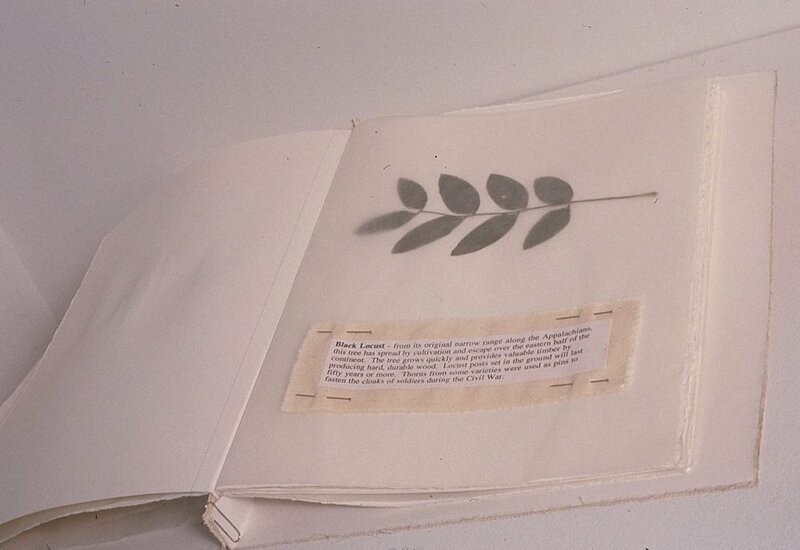 A book was fabricated to accompany the installation. 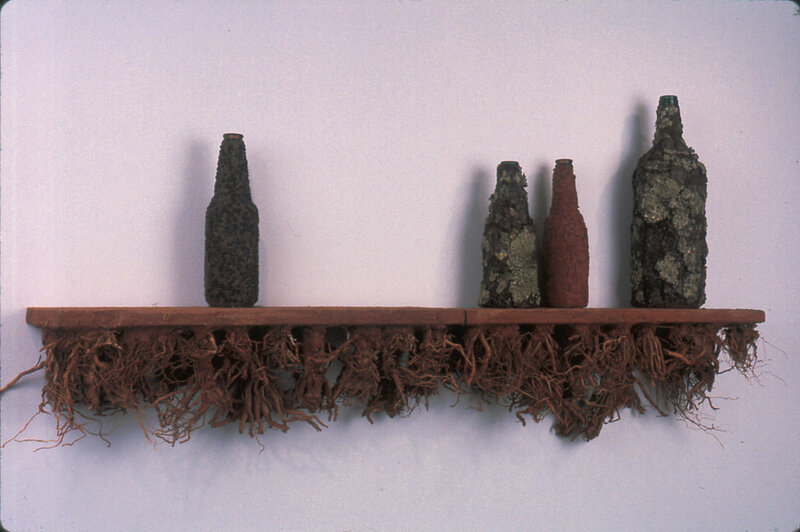 On the opposite wall Pou mounted her own sculptural objects fabricated from natural materials. On the full Hunter’s Moon, Pou collected, pressed, and mounted more leaves from the park as they changed from green to gold, red, and orange. This process continued through the Full Beaver Moon. Throughout the fall Pou conducted weekly workshops with two third grade classes from P.S. CES 90. The students and teachers made weekly field trips to the museum where they wrote stories, did drawings, made artist’s books, and studied the biology and natural history of trees as well as their mythology and folklore. During the Full Cold Moon, in preparation for the Winter Solstice, Festival of Lights and Christmas, Pou worked with each student to make an individual contribution to the installation in keeping with the practice of giving offering to sacred trees. This practice was the ancient origin of decorating the Christmas Tree. Each student made a xerox cut out of their hand and then wrote a poem or wish related to trees on the back. One by one the students added their “hand offerings” and wishes to the wall of leaves. The installation was now complete – beginning with the eyes of the tree spirits, adding the thousands of individual leaves as the seasons changed, and ending in celebration of winter and re-birth with the representation of so many hopes and wishes. 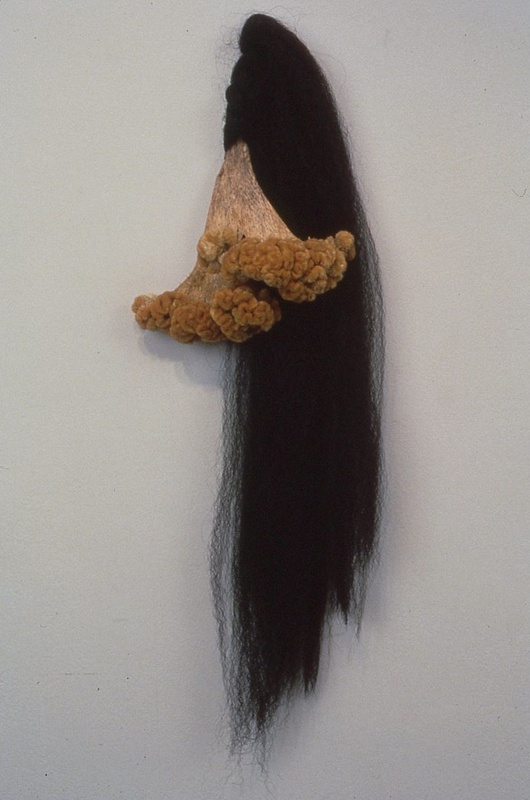 Artist Alyson Pou will host a gallery talk on her current exhibition “Under the Hunter’s Moon” at The Bronx Museum of the Arts, Wednesday, January 10, at 7pm. The event, open to the community, is $3 for adults and $1.50 for students. From Indian Summer, to autumn, to winter, Pou’s ever-evolving installation (on view through January 14) combines natural materials to capture the essence of seasonal changes. Pou employed oral history, folklore and science to evoke the wonder of the changing environment. A long time community worker and teacher, Pou collaborated with a group of local school children from C.E.S 99 to facilitate the evolving themes of her installation. The children collected natural elements from neighborhood gardens and parks. "I think this is the most magnificent installation. I love the ritual aspect of gathering the leaves on the day of a full moon and the changing of the leaves during the season. I am fortunate to experience this and I truly feel enhanced as an artist by viewing, reading and being a part of this work, while this work is a part of my unknown self." 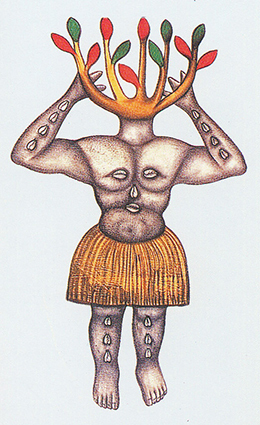 The Kiwai of Anew Guinea, believed that trees were inhabited by spirit beings who were connected with the soul of the tree. 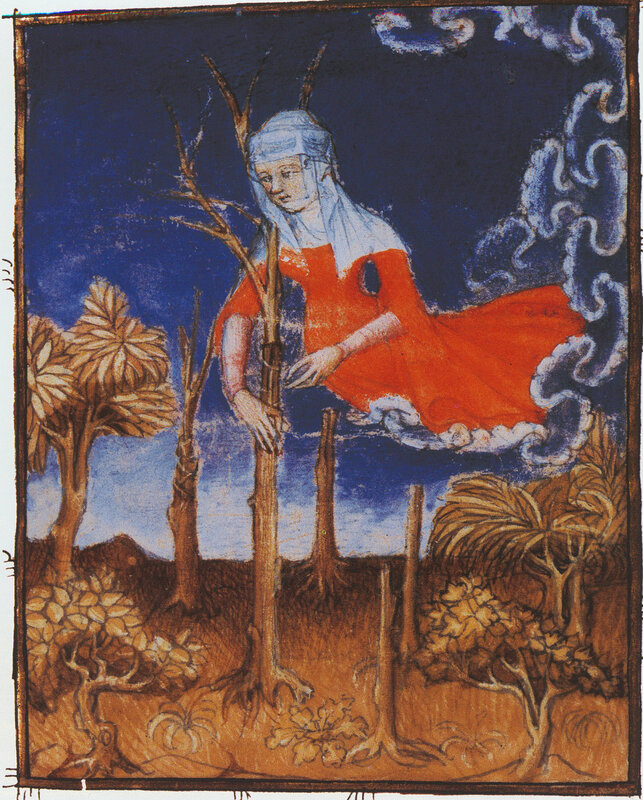 Before the tree could be felled, the asman would request that the spirit move to another tree, and if his arms felt heavy while cutting or the work seemed hard, it was a sign that the spirit had not yet deserted the tree. 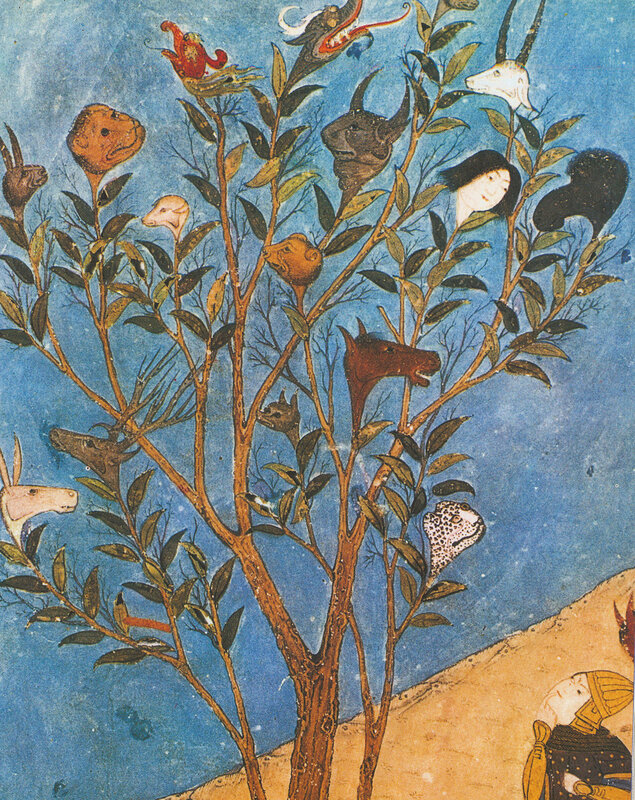 In ancient times trees were believed to have special powers or represent certain mythical gods and goddesses. In early Greek culture there were sacred groves where special ceremonies were held and offerings were tied in the branches of the trees. The stone columns of later temples harked back to this early practice and symbolically represented the trunks of mighty trees. In Celtic culture “Bauming” (adorning) the Thorns” has happened every July 5th near Warrington in Cheshire, England for hundreds of years. On this day a special thorn tree is adorned with flowers and ribbons. The people danced around the tree, and the ceremony is followed by sport and amusements.